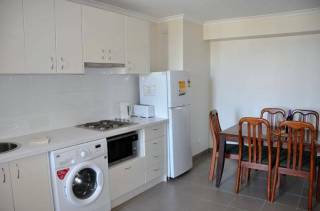 A full and perfect renovation of this one bedroom apartment makes it ‘Home from Home’ while you are away for business, holiday or meeting up with relatives. This self-contained unit has its own private entrance, then up a flight of stairs to a peaceful comfortable home. It is beautifully decorated and equipped throughout. A ‘Hamptons style’ kitchen which is a delight to see has french doors that open on to a balcony, great for barbecues & outdoor living in the warm weather with roof top & district views surrounded by plenty of green foliage. The compact living room features a gas fireplace, Not just for watching, but to keep the apartment warm during the cooler weather. A comfortable sofa with a flat screen TV, dining table and chairs by the window looking out to the balcony creates a charming & comfortable atmosphere. The spacious bedroom is decorated with good taste and interesting furniture. A queen sized bed and a comfortable armchair as well as a desk & chair – just in case !! . Bedside lights and a radio alarm with an Ipod dock. There is a built-in wardrobe with hanging space and set of drawers to keep your small items of clothing. The contemporary light & bright bathroom includes a walk-in shower & laundry cupboard. 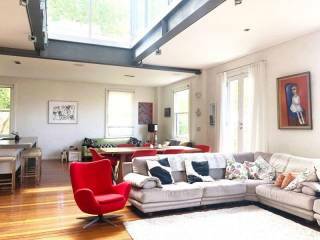 10 minute walk to North Sydney Station for trains to the Upper North Shore & to the city centre. 15 minute walk to McMahon’s Point Wharf where a regular ferry service with only one stop to either Circular Quay or Darling Harbour. The apartment is above a cafe which is great for morning coffee and breakfast, there is some noise during the morning coffee rush. An eclectic culture that's young and fresh, harbour front walks and verdant parklands inform the sunlit alfresco lifestyle on the Lower North Shore. Travellers will appreciate the area as a convenient, and comfortable - base from which to explore the wider city, as well as containing many shopping opportunities, and parks, gardens, and views. 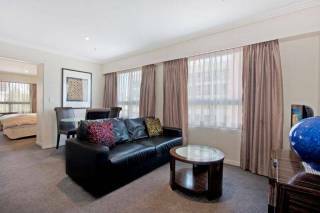 Close to Sydney's major events and attractions. Gems such as Peter MacAllum Harbourside swimming pool. Lounge on the decking or float in the pool whilst looking at the bridge and opera house. 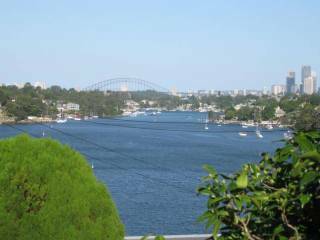 Visit Blues Point reserve for a picturesque view of the harbour. This area is home to one of the best preserved Art Deco cinemas in Australia - the Orpheum. From here, a multitude of buses running every few minutes in peak hour, and every 10 minutes out of peak hour, will take you just 15 minutes to the city or (in the other direction) to Manly and other beautiful northern beaches. 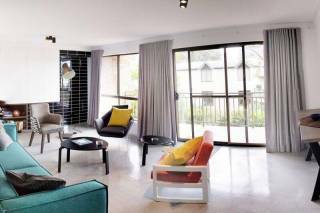 You can easily access Chatswood Shopping Centre, Greenwood plaza and the beautiful boutiques that you will find along military road and in Mosman. The Lower North Shore is also teeming with bars and eateries. Charges start at the advertised price depending on season, and duration of stay. Lower pricing applies to the winter season; the highest is over the summer and Xmas holiday period. A bond is required to secure this property. The bond is returned at the end of the lease after a satisfactory inspection of the apartment. We can supply a 3G wifi modem if required; (extra charge); let us know when you book if you will require one.